You just never know what will be admitted next here at REGI. We go from large bird to small bird in the same hour. Yet each is so special in its own way. People ask me all the time what my favorite bird is. The honestly answer is, probably the one I am holding at the time. There are few things more beautiful than the Red-bellied Woodpecker. They are incredibly "soft" to the touch. They have a curious nature and often come close to people. They are definitely a favorite at bird feeders this time of the year in the northland. 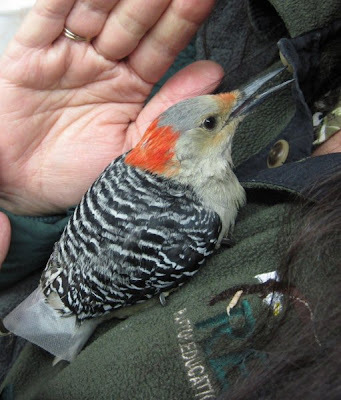 Our Red-bellied Woodpecker patient has an injury to the tongue which I think is physical. The tongues of woodpeckers are fascinating and curl around the brain. Just think about that for a minute. :) This woodpecker is still unable to move the tongue, so we are carefully dropping food into its mouth until the tongue heals. The left wing is also fractured but that is the least of this little ones problems tonight. Bird bones are hollow and therefore heal very quickly. Hollow bones are lightweight and facilitate flight. They are also very strong. Often within 10 days the smaller birds are back on the wing with no ill effect. We are careful not to leave the wing wrap on too long or the wing could become atrophied and the joints frozen with lack of movement. That could ground a bird permanently. 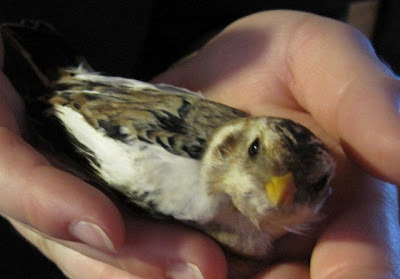 The Snow Bunting admitted with a wing fracture has recovered and is flying now. He was put in the outside aviary so he can continue to exercise and prepare himself for release. Just like us, when birds have a fracture, they lose muscle tone. Their muscles have to be back in perfect shape before they are released or they are at risk of predation or being unable to feed themselves adequately. We typically don't care for non-indigenous species, but when any bird is in trouble we get the call. 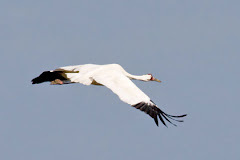 Often people are not sure what species the bird is. In those cases it is best they bring it into REGI so we can be certain if it is a protected species. If it is not, we still care for it until it is well and can be placed in a zoo or game farm. 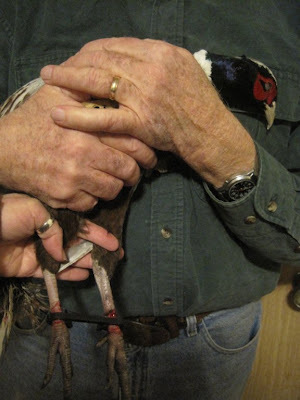 Non- indigenous birds are not released to the wild, since they are not native to the area. Tonight a family called with a concern about a bird that looked like a pheasant. They were able to catch it up easily. They drove it over a half hour to REGI. It is a pheasant. There was a reason they were able to capture it so quickly. It has the most odd thing on his legs. I have never seen anything like it. The legs were held together with a plastic clip apparatus. After we removed the clip from his legs. We put him in a heated enclosure. He just kept looking at his legs. He picked them up one at a time as he continued to look at them. It was as if he could not believe he could use his legs again. It was a tear- jerking moment. I hope there is a logical explanation and not some cruel system that someone has come up with for some reason. If any of you blog readers know, fill me in please. This clipping at the pheasants feed is very odd an sad. I hope you can find out what it is and who did it! ... and thank you for your work!